These snow cover maps are made from observations collected by the Moderate Resolution Imaging Spectroradiometer (MODIS) on NASA’s Terra satellite. Snow globes, those favorite vacation souvenirs, let even those who live in warm climates see snow fall. From their vantage point in space, NASA satellites get to see a real snow globe, as they observe the seasonal falls that cover portions of the planet with the white stuff. 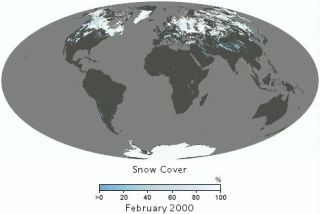 A set of observations collected between February 2000 and November 2011 by the Moderate Resolution Imaging Spectroradiometer (MODIS) on NASA's Terra satellite has been stitched together to create an animation of Earth's snow cover over the past decade. Areas in medium blue have a snow cover of more than zero percent and white areas are covered 100 percent, with other colors ranging in between. Land that appears gray either had no snow cover or was an area not covered by MODIS data. Because MODIS relies on visible light to assess snow cover, the sensor cannot collect data over the highest latitudes of the Northern Hemisphere during winter when no sunlight reaches those regions. Snow and ice cover most of the Earth's polar regions throughout the year, but the coverage at lower latitudes depends on season and elevation. High-altitude landscapes such as the Tibetan Plateau and the Andes and Rocky Mountains maintain some amount of snow cover almost year round. Land area is larger and snow cover is more variable in the Northern Hemisphere than in the Southern Hemisphere. This article was provided by OurAmazingPlanet, a sister site of SPACE.com.